I’ve been knitting away, but not necessarily with much visible progress lately. 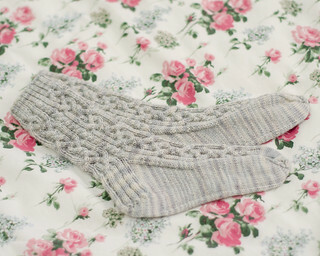 My socks are done~! ♥ In the end, I didn’t make the legs any longer than the pattern recommended–I was worried about running out of yarn, which was silly because I have tiny feet and there are always plenty of leftovers, but I worried anyway. I love-love-love the finished socks! The cables are gorgeous, the socks are not short enough to make me regret my decision, and the colour is beautiful~ I haven’t even worn them yet–I just hold them and sigh happily, haha! As soon as I finished the socks, I started on an epic sweater. Why is it epic? Well, many years ago my stepfather lived and worked abroad in Ireland. When my mother visited him for a vacation, they brought back souvenirs for the family. I got yarn. (When I was given the yarn they told me that when looking for something for me they initially were going to get me a sweater, but the sweaters were expensive so they opted for the yarn…) I’ve held on the to yarn for a long time, but it was destined to be the last yarn in my stash for knitting…and with the socks done, that project’s hour was struck!